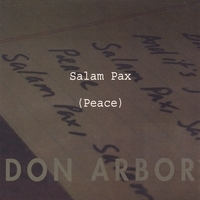 While listening to Don Arbor’s Salam Pax (Peace) for the first time, there were moments when I had to check my iPod to see if another Don – Don McLean of “American Pie” fame – was singing. Both Arbor and McLean have softly dramatic and honey-warm voices. I’d be stunned if McLean wasn’t one of Arbor’s influences. However, I don’t think it’s intentional; Arbor is simply blessed with a crystalline croon. The title track is a moving tribute to an Iraqi blogger who wrote about his daily life in Baghdad, enveloped by war and despair. It’s not a political song which takes a right or left side of the electoral map; rather, it’s a human cry to stop the bloodshed. Musically speaking, jazzy horns and Steely Dan-esque light funk make the grim subject matter go down smoothly. “Every Silver Lining Has a Cloud” echoes the dreamlike folk balladry of Bread while “I Let It Go” recalls the winsome harmonies and spring jangle of George Harrison. Throughout it all Arbor’s vocals seduce and evoke a myriad of emotions.